Maxview Mark 3 B2590 Crank-up roof mounting dish kit. Ideal for Caravans or Motor Homes. Now with twin LNB as standard. Mk 3 Model. Improved design. Streamlined. Twin LNB. Please note, this is not an automatic roof folding dish but it is quick and easy to set up. Low profile, height of kit when folded down : 17cm. Weight of system : 65cm 9 Kg, 85cm 10Kg. Mounting Plate : 50cm x 50cm. 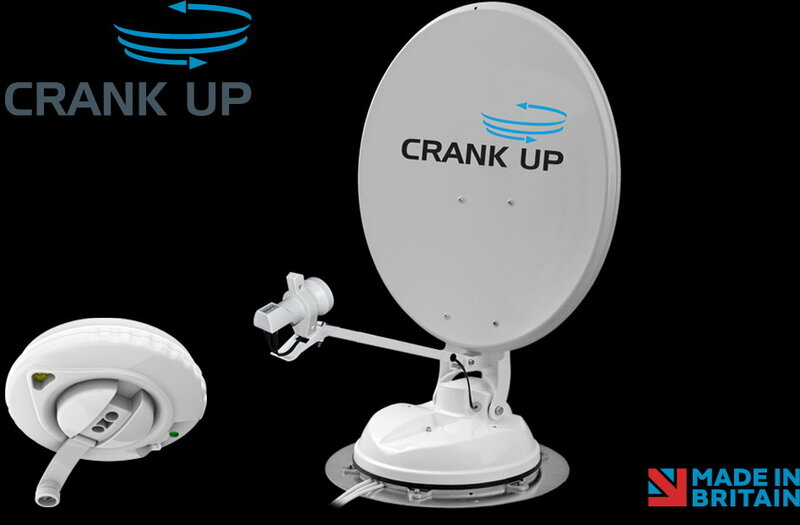 Maxview Omnisat 65cm and 85cm 'Crank Up' satellite dish kit system. Comes with 3 years Maxview guarantee. 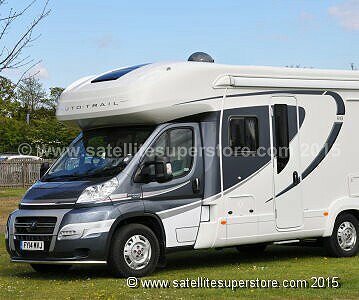 for money, make the Crank Up an obvious choice for any leisure vehicle" Bill, RDH Motorhome Centre. thanks for a great price and service, regards, Bob"
from the selection of meters. Click here to see the four discounted meters on special offer when you buy this kit. (Normal price £79.95). The Lion G250L100 Micro is also ideal for use with this dish. See combined package price below. 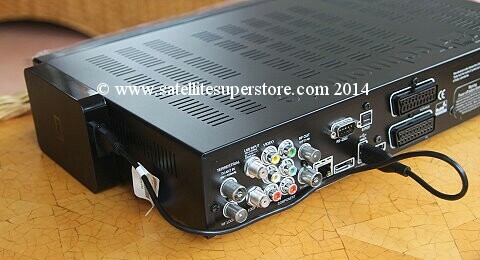 Need a 12V TV? 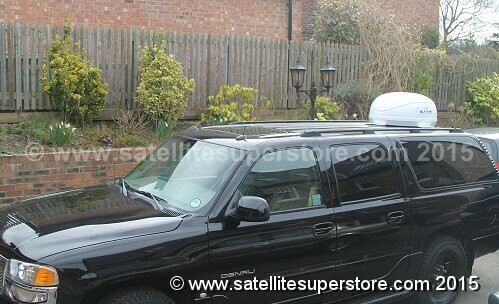 See the Cello 12V traveller TV with satellite, terrestrial and DVD built in. For "UK offshore islands including Northern Ireland by courier" many items including dishes up to 1.0m choose the £15 - UK option No 2. Maxview Mark 3 B2590 Crank-up roof mounting 65cm folding dish kit. 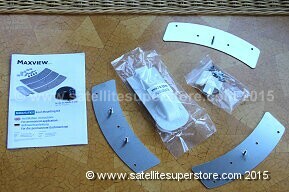 Maxview Mark 3 B2590 Crank-up roof mounting 85cm folding dish kit. 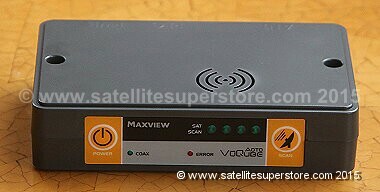 New Maxview VuQube II Automatic. Twin LNB. MXL023. Roof top or carry. Please note - all Qubes are now white. Dual Purpose. Carry or roof mounted dome. Strong carry handle. This is the new fully automatic dual purpose VuQube II. 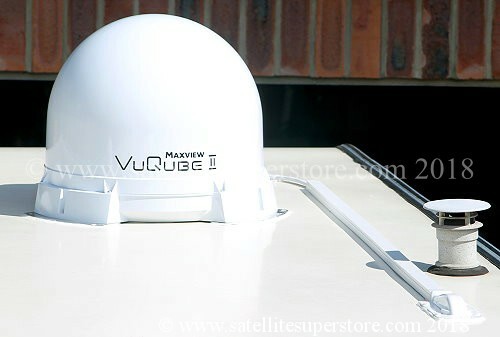 Carry like the VuQube 1 or fit on the roof * like the Maxview MXL011 dome. compared to other domes. As a carry around product it is light and very easy to carry and store. It will automatically find the satellite. Very fast and easy to use. The dish size is equivalent in performance to a 50cm dish. This makes it ideal for the UK and northern France. cable, however, if you plan on using the twin LNB for 2 receivers or a twin tuner receiver, you will need the extra cable option below. fit the dome onto a roof. Important tips on how to do a good job! motorhome here if the system needs servicing. Our normal BT phone number help-line is also available to assist all of our customers. (Normal price £79.95). The Lion G250L100 Micro is also ideal for use with this Qube. See combined package price below. For "UK offshore islands including Northern Ireland" many items including dishes up to 1.0m choose the £15 - UK option No 2. 10m of CAI approved Webro WF100 digital cable with professional compression F connectors fitted. 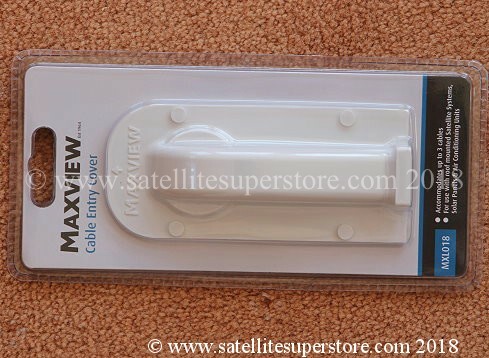 This kit is included when you buy a Maxview VuQube, but might be useful for other domes or projects. It comes with our own additional instructions on how to fit it all correctly (cables and trunking not included). 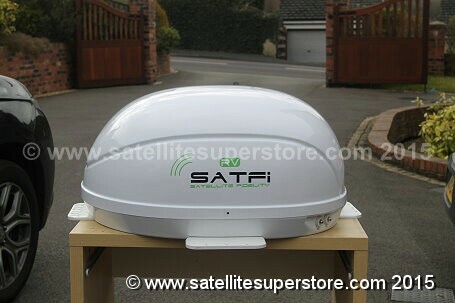 SATFI UK+ compact self-seeking dome. Please note we are an authorised Satfi, dealer, service and repair centre. 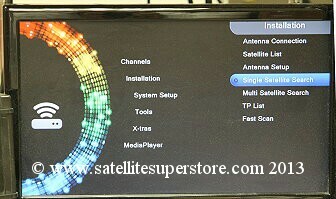 Compared to the standard SATFI above this "+" offers some more features and is a more streamlined shape. Fully automatically finds the satellite while stationary. This is a low profile, slimline dome. Designed for use in the UK. 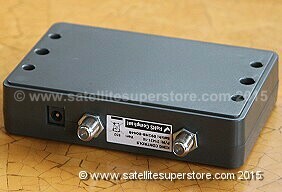 Can be used on Astra 2 for Sky or freesat and 2 other satellites, Asta1 and Hotbird. Also fine in Northern France. no reason why it could not be used on an SUV but this is mainly to show the size and low profile on the roof of a vehicle. Dome diameter (footprint on the roof) 70cm. Dome height. Only 26cm. Dome weight Only 9Kg. Fully automatic. Single cable connection. Ultra compact. Compatible with Sky receivers. Compatible with Freesat receivers. no tall buildings or tall tries close and to the south of you. Remember all satellites are in the southern sky. this can change if the satellite provider reduces power levels. 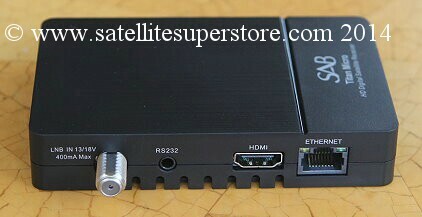 The Satfi RV and EU are listed below. Special offer. A Lion G250L100 mini 12 volt receiver is included FREE (Normal price £79.95). 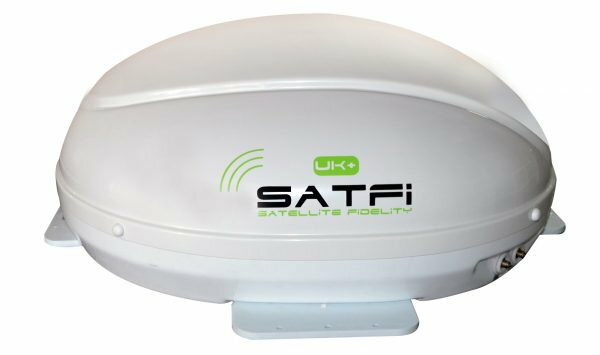 SATFI UK+ self-seeking automatic dome. Twin LNB. Free Lion 12V receiver. Satfi UK+ self-seeking dome. Twin LNB. With Lion mini 12V receiver. Fully automatic. 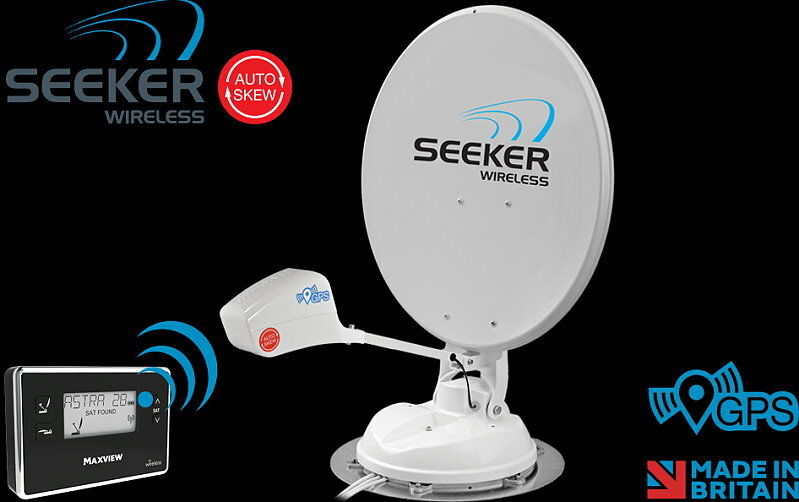 Features: • Simple easy to use operation with integrated FTA receiver and antenna controller. (like Sky+ HD or Freesat PVR) but it is not possible to record a different channel than the one being watched. that are available or programs with English sound tracks from other countries. Dome height still only 36cm. Dome weight 12Kg. Dome diameter 83cm (footprint on the roof). Single cable (or twin cable) connection. provider reduces power levels. The Satfi UK+ is above and Satfi EU is below. (Normal price £79.95). 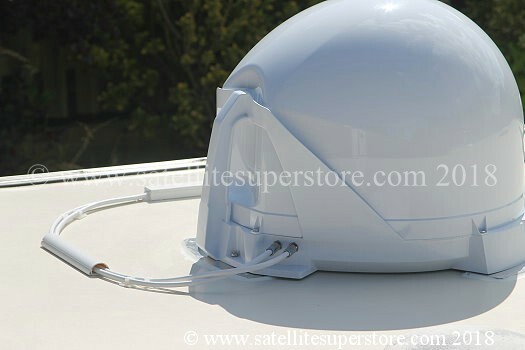 The Lion G250L100 Micro is also ideal for use with this dome. See combined package price below. 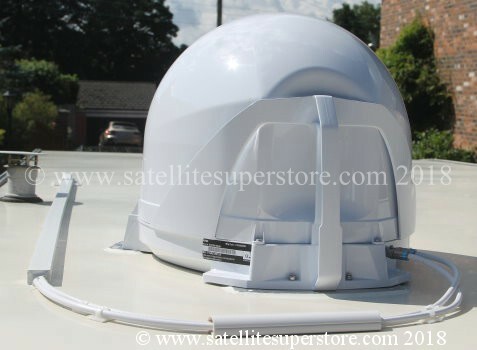 Satfi RV self-seeking dome. Twin LNB. With Lion mini 12V receiver. 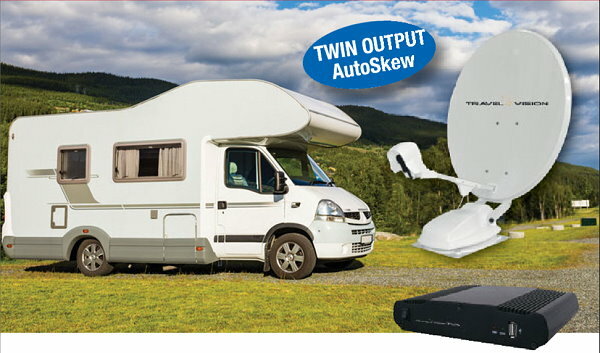 Similar to the RV above but with GPS aided autoskew to peak max signal. 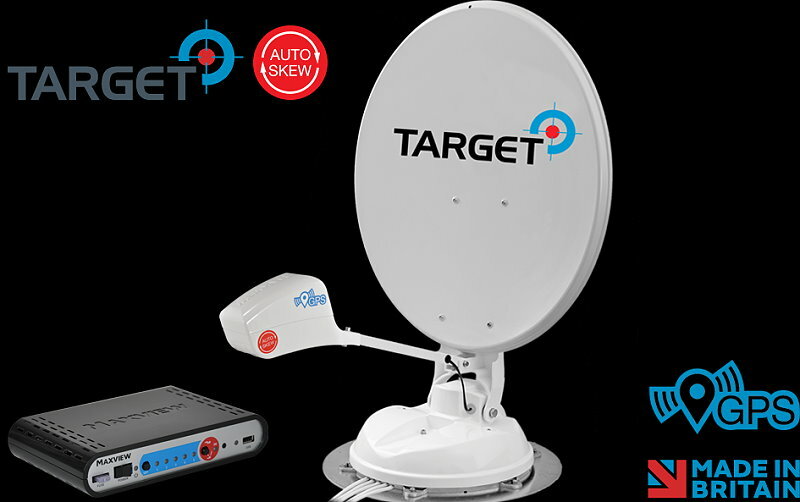 • Sky & Freesat SD/HD Compatible, • Single or Twin LNB Models Available, • High gain EU capable, GPS Autoskew. provider reduces power levels. The green line is for the Satfi RV. 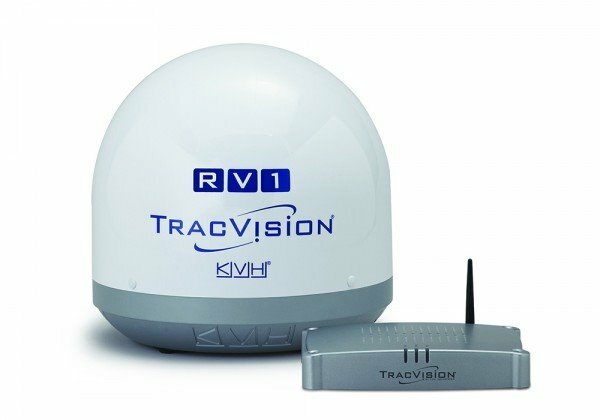 The Satfi UK+ and RV are listed above. Also note the Satfi EU has Diseqc control for automatic selection of satellites from the satellite receiver. 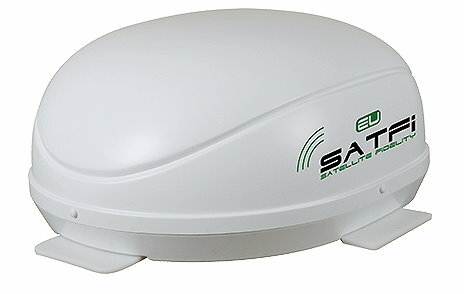 Satfi EU self-seeking dome, twin LNB with Lion mini 12V receiver. One of the highest gain domes available. Largest tracking dome for Europe. 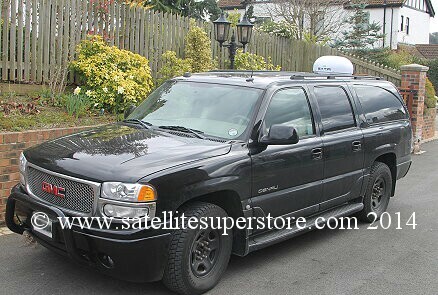 Track the satellite and watch TV while on the move. Watch different channels on 3 TVs using the triple LNB. recorded when used with twin tuner receivers and a single tuner receiver as well. Dome diameter 83cm (footprint on the roof). Triple cable connection. Satfi GO self-seeking dome. Twin LNB. With Lion mini 12V receiver. 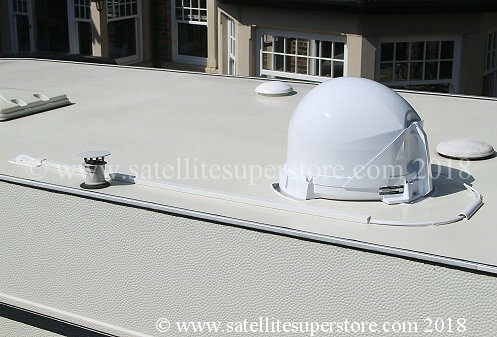 This tracking dome has a gain of 31.5dB and is only 20cm high. 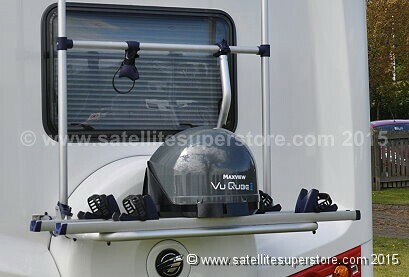 Ideal for motorhomes and narrowboats. Low profile. Tracks the satellite while moving. Fully automatic. Please note we are an authorised Traxsat distributer, dealer, service and repair centre. 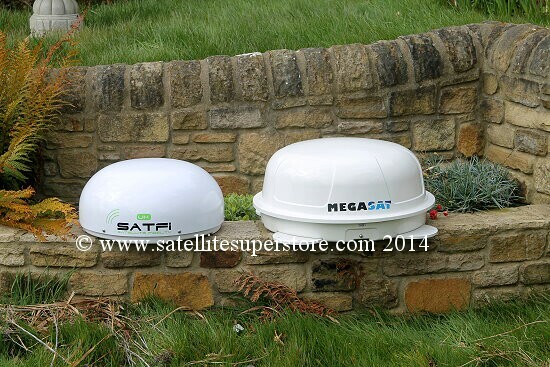 Features: • Installed satellites - 28E, 19E, 13E and 27.5W. • Fast tracking as you move. • High gain • EU capable. 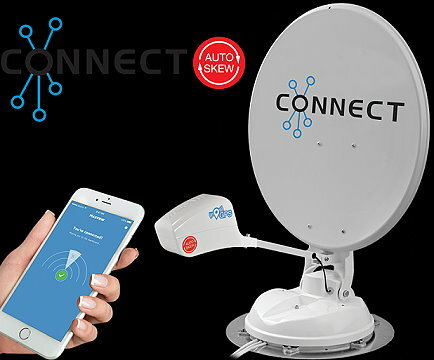 • Tracks and locks onto the satellite when either moving or stationary. • Compatible with Sky receivers and with freesat and standard free to air receivers. • HD and 4K compatible. • High gain. • Weighs Only 12.5KG, • Height 200mm, • Diameter 780mm. the dome tracks and stays on satellite. that an air conditioning unit on the roof. 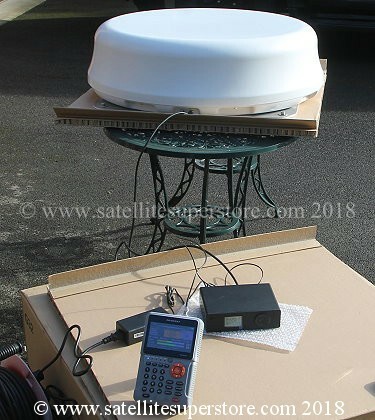 Reception in the UK - this dome will work on all Astra 2 channels from the north of Scotland to the south coast of England. 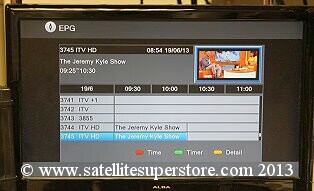 to switch to other satellites, some UK based channels can be found when further away from the UK. e.g. BBC World. equipment it may be possible to receive the BBC and ITV in Spain and Portugal from this satellite. larger models for the UK and Europe on the right. For exact details of coverage please email or phone. self seeking dish with autoskew. Please note we are an authorised Travel Vision dealer, service and repair centre. of only 21cm when folded. This allows installation on high vehicles with minimal effect on the headroom. 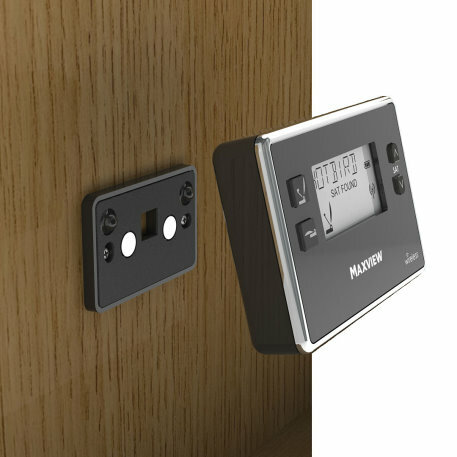 Controller included, the touch of a button quickly finds the selected satellite and it is all fully automatic. The only automatic dish with "autoskew". This maximises the signal levels from the LNB. Ideal in low signal areas. Pre-programmed for 8 satellites Including Astra 1, 2,3 and 4, Hotbird, Thor, Hispasat and Turksat. See the Sab Titan Micro mini 12 volt receiver (special offer) below . The Sab Titan Micro is also ideal for use with this dish. 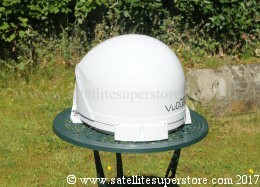 Travel Vision TVA80 twin LNB self seeking autoskew dish with Lion mini 12V receiver. 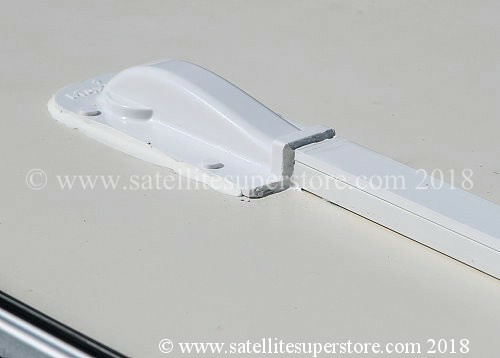 Wireless Automatic Twin LNB automatic dish. Latest Autoskew/GPS model. Ideal for Caravans or Motor Homes. Twin LNB included. LNB as standard. 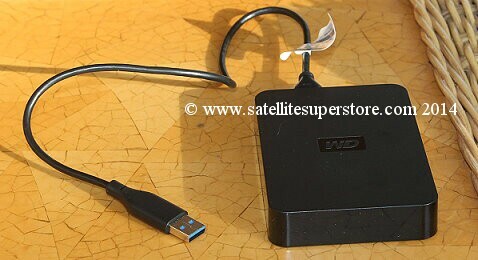 Designed for use with SKY+ HD receiver or freesat twin tuner free to air receiver with hard drive recording. Alternatively can be used to feed two separate receivers for independent working. Profile only 17cm. 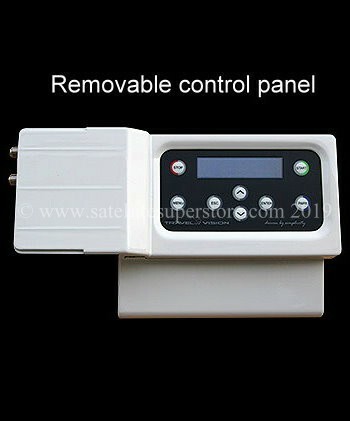 Wireless control panel. unlimited mounting options and easy installation, making unsightly cable runs and fixing problems a thing of the past. with Lion mini 12V receiver. 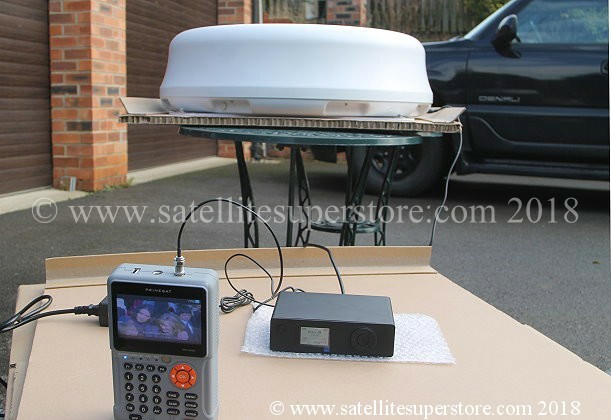 Only £29.95 extra for the mini 12V satellite receiver. 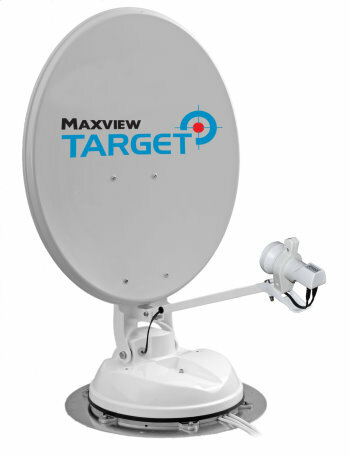 Maxview Target MXL017 Automatic Self Seeking Dish. TWIN LNB. Standard model and Autoskew/GPS model. As soon as you turn it on, the dish rotates and searches. It finds the satellite automatically. Weight - 65cm 12Kg, 85cm 13Kg. single tuner receivers or free to air receiver. Alternatively can be used to feed two separate receivers for independent working. Average search time: 30-60 seconds typical. Run two twin tuner receivers, four single tuner receivers, or a multiswitch. 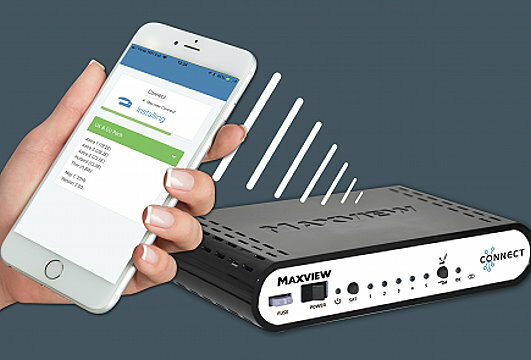 single tuner receivers or free to air receiver. Alternatively can be used to feed four separate receivers for independent working. tuner free to air receiver with hard drive recording. Alternatively can be used to feed two separate receivers. viewing and a greater range of satellites. Wherever you travel, Connect ensures you can stay connected. the LNB to maximise satellite reception, a necessary addition when travelling at the edge of you chosen satellite footprint. Control with your smart phone. Ideal for Caravans or Motorhomes. It finds the satellite automatically. Weight - 65cm 12Kg, 85cm 13Kg. Quick and easy. Easy to install. (Motorised). Ideal for Caravans or Motor Homes. Twin LNB. Bag included. e.g. 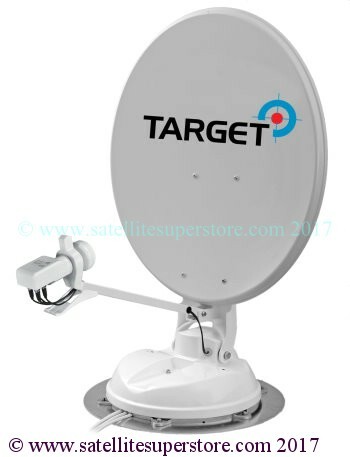 Astra 2 for freesat or Sky TV and the dish will automatically turn, adjust and find the satellite. caravan or motorhome). 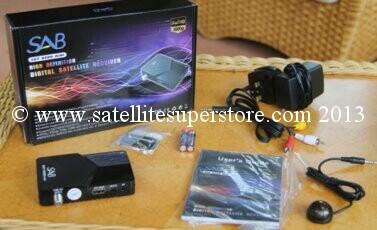 This is a very fast way of having satellite TV with full automation and ease of use. The antenna unit, control panel and tripod all pack away into a strong canvas bag for easy transport. Compact and easy. 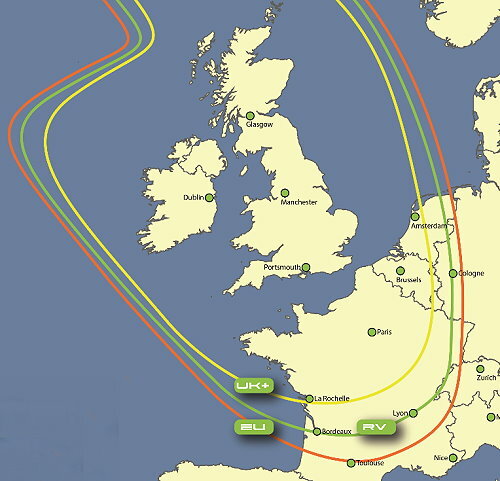 The right hand picture / satellite black and blue lines / footprint above shows the excellent coverage across Europe. Please note, many dealers do not include the canvas carry bag above but when you buy an R7 from us the bag is included. A canvas carry bag for the controller is also included - see pictures below. 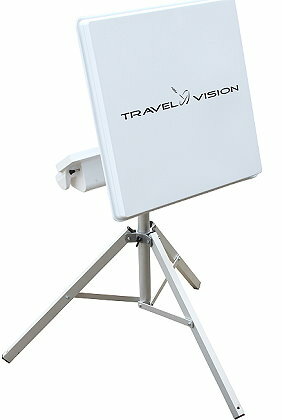 Travel Vision R7-Flat automatic satellite antenna with tripod and carry bag. 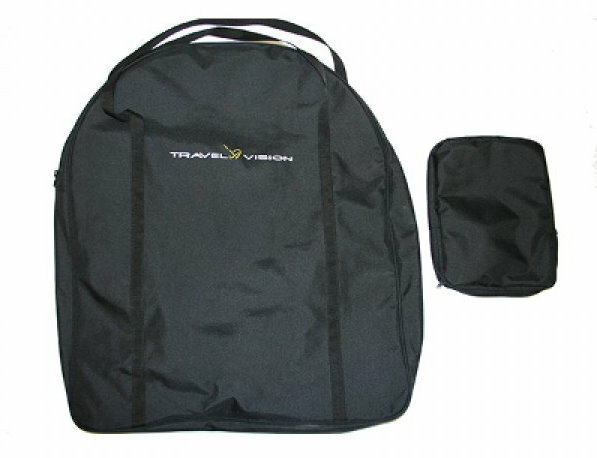 Travel Vision R7-Flat carry medium size bag. Please note, many dealers do not include the bag above but when you buy an R7 from us the bag is included. You can buy a spare bag here. 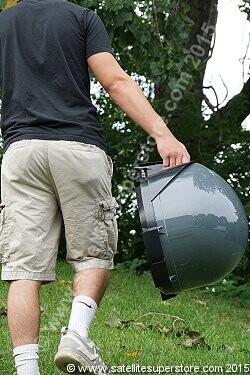 Watch satellite TV while moving. Single cable solution tracking dome. design makes installation a very easy! Profile - 34.3cm Diameter / footprint - 33cm. Weight 3.5Kg. Single cable design. 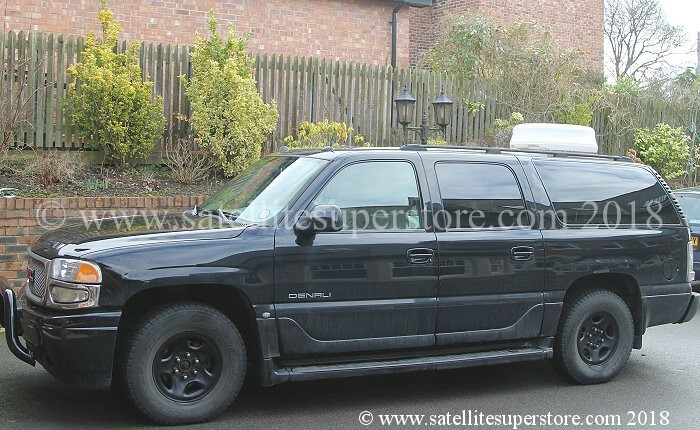 Get your favourite satellite TV programs from Freesat or Sky TV on the road! if you are already ordering a self seeking dish/dome, semi automatic dome or Maxview crank-up. The Sab Titan Micro can be ordered by itself at the normal price here. This hard drive has a £10 discount compared to the "sold separately" price. Primesat satellite meters - sf500 SF-700 PHW-7186 Meters advice Compass - Digital Lensatic All caravan products - menu page. •	Products that we manufacture (e.g. We have manufactured heavy duty wall mounts and ground stands since 1991). •	Selected products which have our own Primesat brand name and have been prepared to our specifications. •	Selected products where we have been appointed the authorised UK or European distributor by the manufacturer.